Creamy beans are the perfect foil to briny, chewy shrimp. 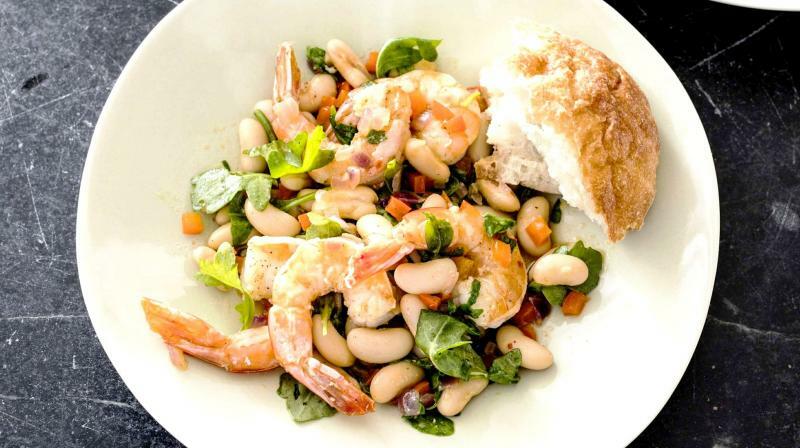 Washington: Shrimp and white beans may seem like an unusual combination, but it is utterly traditional. The dish consists of beans when cooked with shrimp, vegetables, and herbs until the flavours blend. The combination works to great effect; the sweetness of the mild, creamy beans is the perfect foil to the briny, chewy shrimp. Canned beans passed muster and are the heart of this dish, but the shrimp play the starring role. Look for a cooking method that will boost the flavour of the shrimp and find that searing on the stovetop worked best. Season the shrimp with sugar, salt and pepper and then add them to a smoking-hot skillet. Within a minute and a half, they are perfectly cooked, seared on the outside as if they’d been grilled and moist on the inside. Briefly cook red onion, red bell pepper, and garlic, which keep their flavours fresh and their texture appealingly crunchy. Tasters loved arugula in this dish as opposed to herbs like basil and rosemary. Its gentle peppery bite successfully married all of the other flavours. Although this dish tastes best when warm, it may be eaten chilled as a salad or antipasto. The cooking time is for extra-large shrimp (about 21 to 25 per pound). If using smaller or larger shrimp, be sure to adjust the cooking time as needed. Pat shrimp dry with paper towels and season with sugar, salt, and pepper. Heat 1 tablespoon of oil in 12-inch non-stick skillet over high heat until it starts smoking. Add shrimp to skillet in single layer and cook, without stirring, until spotty brown and edges turn pink on first side for about 1 minute. Off heat, flip shrimp and let sit until opaque throughout, about 30 seconds. Transfer shrimp to bowl and cover to keep warm. Heat the remaining 1/4 cup oil in now-empty skillet over medium heat until shimmering. Add bell pepper, onion and 1/2 teaspoon salt and cook until softened, about 5 minutes. Stir in garlic and pepper flakes and cook until fragrant, about 30 seconds. Stir in beans and cook until heated through, about 5 minutes. Add arugula and shrimp along with any accumulated juices and gently toss until arugula is wilted, about 1 minute. Stir in lemon juice and season with salt and pepper to taste. Serve. Is workplace hugging a big no-no? Bisi Bengaluru: Egg-static at the feasting! Go vegan for a greener planet!